Upon request of the United Nations agencies, UNV mobilizes around 6,500 UN Volunteers who work on development projects and humanitarian and peacekeeping operations every year. Engineers and workers are part of this US $14 million project to facilitate the removal of debris of destroyed homes and other civic infrastructure in the Gaza Strip, State of Palestine. 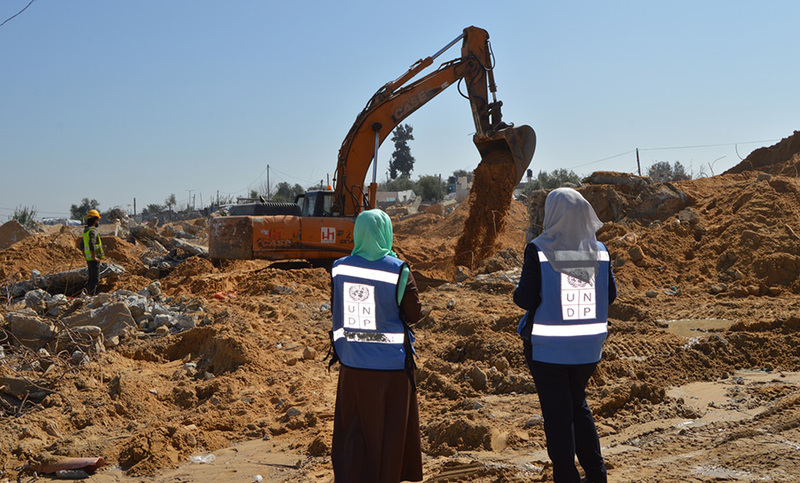 Four female engineers are also part of this programme as national UN Volunteers helping to rebuild Gaza, including Mona Ouda (left) and Diana Abu Ramadan, national UN Volunteers with UNDP’s rubble removal programme. UNV is as strong as its partnerships. UN Volunteers deliver on sustainable development for our United Nations partners. In 2017, 6,501 UN Volunteers from over 100 different professions served with 38 United Nations partners in support of peace, security, human rights and humanitarian delivery worldwide. Furthermore, 17,893 UN Online Volunteers completed 23,000 assignments via the UN Online Volunteering service, providing flexible solutions to 38 United Nations partners and 2,200 non-governmental organizations. Click on the names of the UN agencies below to get the latest annual data of UN Volunteers serving with them.